Despite a drop in profits within the steel market this year Al Ezz Steel Rebars, the biggest independent steelmaker in the Middle East, predicted a positive forecast for 2010. The announcement led to an increased wave of interest in the Company and also a rise in steel prices. The prediction came as a shock to many operating within the market, particularly when it came from Ezz. A report in November 2009 put profits down 75% during the first 9 months of 2009 compared to the same period of 2008. This comes as a result of a decline in steel prices and the decrease in the company’s output of flat products. Flats market (This refers to “flat” steel products such as plates, hot-rolled strip and sheets, and cold-rolled strip and sheets rather than “long”) experienced a strong fall in sales and production as a result of a very weak global market. Ezz Steel exports went down by 50%, leading eventually to the closing down of the Suez facility of Ezz Flat Steel at the end of 2009. Attributing the fall in profit to the weak global market the company stated that robust domestic demand would soon help fill the gap. “Ezz Steel remains confident about the continued strength of the Egyptian market, which has remained largely unaffected by the global economic slowdown,” the company said in a statement. “Conditions in the global flat steel market had been very weak since the last quarter of 2008, but we are starting to see some signals of improvement,” it said. The company said production for the home market was at record levels as domestic demand was strong. Analysts said steel rebar demand had remained relatively resilient in Egypt because of the need for housing and government infrastructure spending. Long products continue to remain in demand. The company increased its long product sales during the first 9 months of 2009 to 2.4 million tonnes compared to 2.3 million tonnes for the same period of 2008 – an increase of 4 percent. It even felt confident enough to announce an LE 150/ton ($27.5/t) increase for its rebar wholesale prices. The increase, intentional or not, led to a trend of growing confidence within the market – leading to a number of other Egyptian Steel producers raising their prices. This included Beshay Steel, who announced an increase for its rebar prices to LE 2,800/t ($515/t) in the middle of November following the raw material prices in the international market. With such an apparent level of domestic demand, and their position in the market, it comes as no surprise that Ezz can live in a certain amount of comfort. CI Capital maintained a ‘Strong BUY’ recommendation for both El Ezz Steel Rebars and Ezz El Dekheila after the Ezz Group announced its increase in selling prices. The Group has also received a LE2bn Egyptian pounds loan from Egypt National Bank and Banque Misr to expand production. The loan will be used to redevelop their operation in Suez, including the production of direct reducing iron plants. A contract has already been inked with Danieli & Co and Tenova HYL for the construction of an ENERGIRON III direct reduction plant capable of producing 1.9 million tonnes per year of cold discharge DRI. 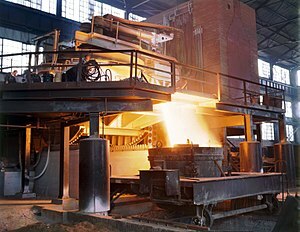 The shaft furnace will be the world’s largest in terms of productivity from a single production unit. The well-constructed announcement by Ezz Steel Rebars has been praised as an example of how a company operating within an international market, during a difficult financial period, can find security in their own backyard. In addition to this, as the leading independent steel maker in the Middle East, their confident assertion that prices will rise has enough legitimacy to provide other companies with the assurance to do the same. As is so often the case, however, it is infrastructure spending which has helped secure the Egyptian steel market. This, in addition to continued demand for residential construction has managed to keep Ezz safe – at least for the next year. Ezz’s next task will be to find itself strategically placed to engage with the international market again once the larger financial situation ends.